In major Japanese cities like Kyoto, one usually doesn’t have to travel far to find patisseries with pastries and cakes of fairly decent quality. We’d managed to visit Pâtisserie Kanae and Pâtisserie Gion Sakai on this time round. But when we are on trips with packed itineraries and timetables to stick to, it is often not an easy thing to travel around tracking down small dessert shops or cafes which one has never been to, navigating tour maps of unfamiliar places in unfamiliar languages. Pâtisserie Jouvencelle is an “old boy” amongst the shops in Kyoto specialising in yogashi, starting with a small cafe in Gion more than 20 years ago. But to start a pastry shop selling Western confections and establish a name for itself in a stronghold like Kyoto with a long withstanding history of traditional wagashi making is by no means an easy feat. They must also be amongst the pioneers to incorporate wagashi ingredients into the French-themed pastries. Apart from the cafe at Gion, Pâtisserie Jouvencelle also has a handful of shops and takeaway counters all over Kyoto. We’d intended to visit the main cafe in Gion but couldn’t find the place. Thankfully, we chanced upon one of their takeaway counters at Karasuma Oike. 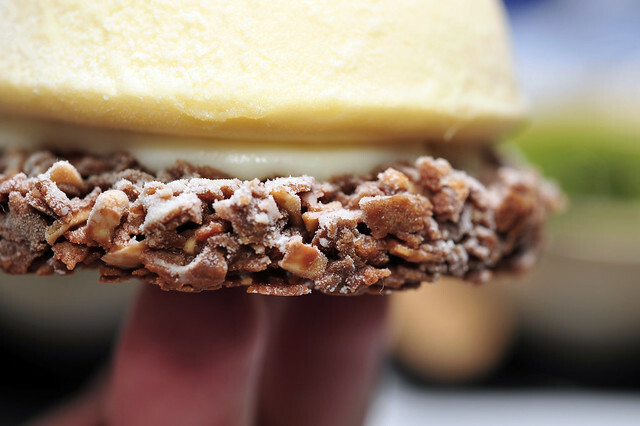 円山 Maruyama is a complex petite gateau with quite a few components – a lemon mousse embedded wth a piece of vanilla sponge resting on a soft, fluffy layer over a praline–feuilletine chocolated amalgamated base. 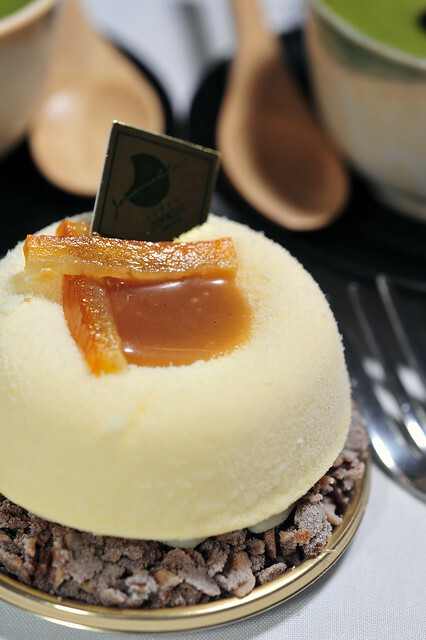 The dimple on the mousse is dolloped with a citrusy coulis-like sauce and candied rind. Close up on the praline–feuilletine base, amalgamated by chocolate and dusted with snow powder. The croquant-like texture was delightfully crisp and aromatic, from the toasted hazelnuts and almonds used in the praline. 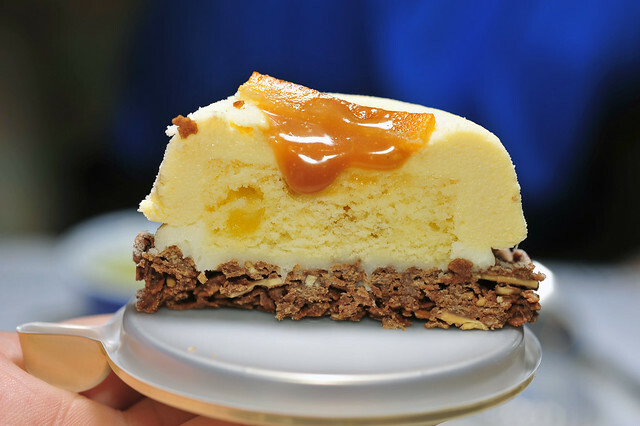 What was more intriguing was the creamy and soft layer that cushioned the main mousse-sponge body from the base. It had qualities of freshly rolled fondant, fluffiness of marshmallow and yet somewhat chewy like mochi. Cross-section of Maruyama. Overall, we felt that the piece was very well-balanced in both taste and textures. It imbued all the desirable qualities one aims to find in a good petite gateau, sweetness from the base with the tart lemon mousse, sharpness from the orange rind over the richness from the chocolate used in the base, rich buttery aroma from the sponge blended with the citrusy perfume from the lemon mousse as well as the coulis, crunch from the feuilletine with the smooth creamy textures of the mousse etc… and I could go on and rave about it. Of course some might be concerned over how complex the piece was but one carefully savours each mouthful, he would be overwhelmed by the plenitude of layers that unfolds between the tongue and palate. A matryoshka doll of pastry making really. 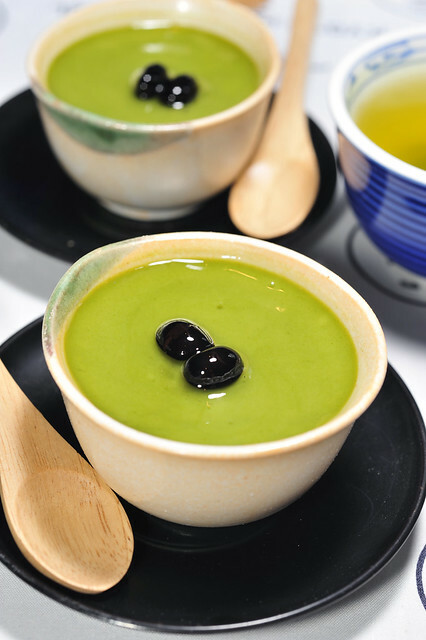 抹茶ぷりん matcha pudding. We were first captivated by the glossy finish over the surface as well as the alluring green hue. Made with fresh milk from the nearby Miyama (美山牛乳), matcha from Uji (宇治抹茶) as well as candied kuromame blackbeans from Tamba (丹波黑豆). 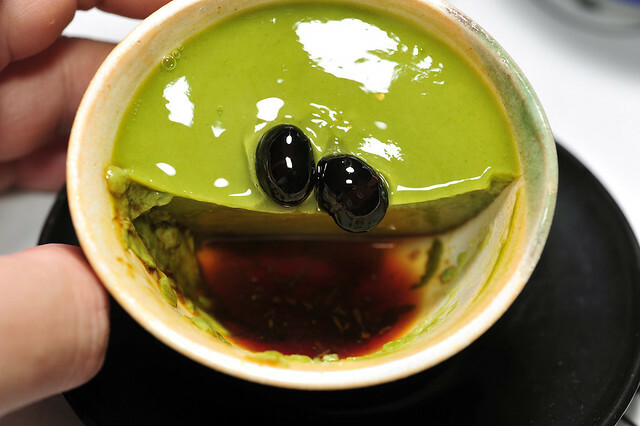 This simple dessert encapsulates the fresh produce around Kyoto. Despite its somewhat zen-like appearance, it tastes really delicious! And it reminded us of the moss and rock gardens we’d visited in the numerous shrines and temples we’d visited! In place of the usual caramel sauce, kurozatou from Okinawa (沖縄黑糖) was used which was so apt! The latter is made from heating freshly pressed sugarcane juice until it thickens and darkens considerably. The tinge of bitterness which cut through the high brix levels from the unprocessed sugarcane. We would definitely visit Pâtisserie Jouvencelle again the next time we are in Kyoto to sample more of their other creations. While we were disappointed for not being able to visit the other patisseries and dessert places we’d planned for, the impromptu encounter with Pâtisserie Jouvencelle was most certainly a good find! This entry was posted on February 23, 2012 by Alan (travellingfoodies). 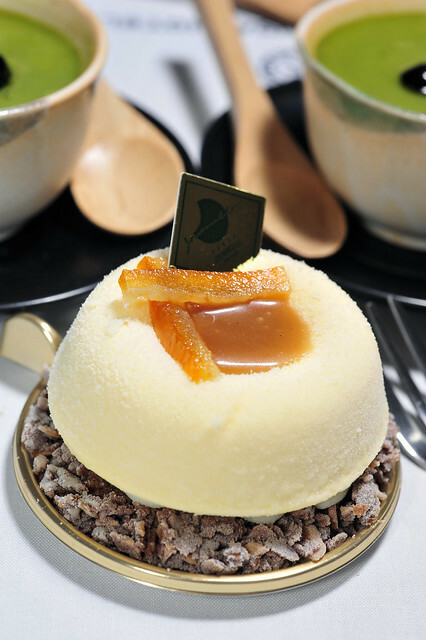 It was filed under Food, Travel and was tagged with croquant, feuilletine, Isetan Kyoto, Kyoto Station, matcha caramel custard pudding, Miyama milk, mousse d' orange， 美山牛乳, Patisserie Jouvencelle Oike kyoto, pâtisserie, praline, Uji matcha, 円山, 宇治抹茶， 抹茶ぷりん， matcha pudding， 円山 Maruyama, 東洋菓子司. Once again you having my taste buds raging! 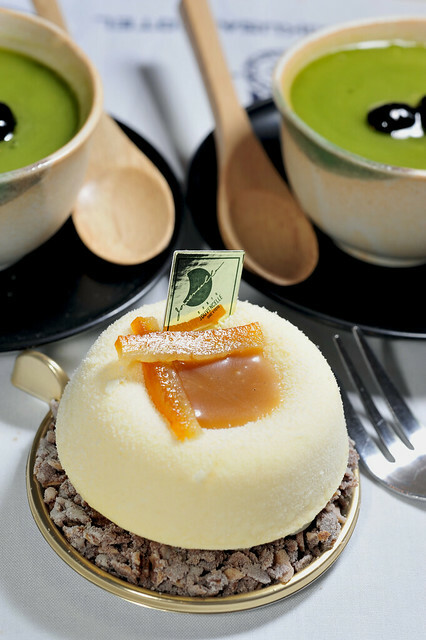 Would you have the recipe for the 円山 Maruyama . Or are you going to try to make it in the future. I need to taste this!